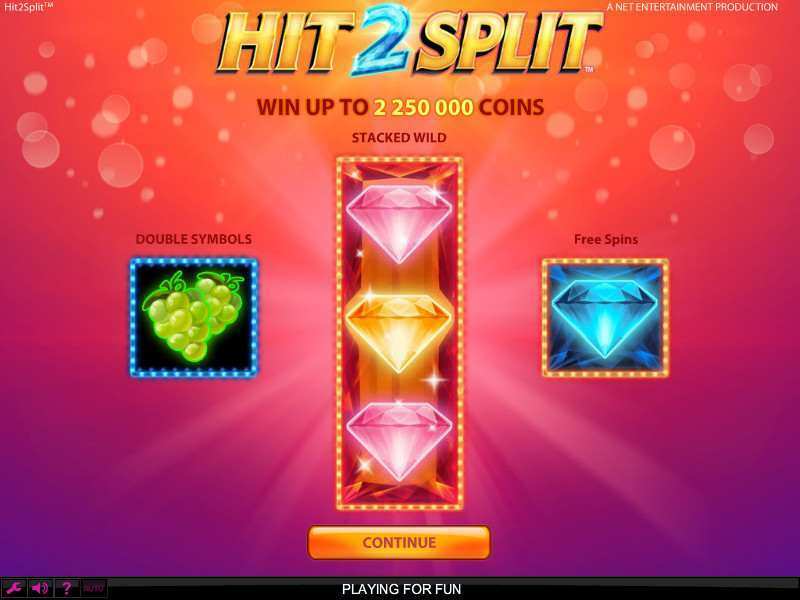 The Hit 2 Split is an online casino game produced by the NetEnt gaming house. This is a modern looking fruit slot machine with a classic 5 reel setup and 30 pay lines. Before starting to play free Hit 2 Split casino slot machine, gamers should be aware of all information and rules related to this game. This can be checked in the “Paytable” window or in the terms and conditions section at your favorite casino. This game comes in two versions. One is for free with no download needed, and every player can access it, and the other one is for the real money slot play. To be able to gamble for real cash, bettors just have to create a free account and deposit some money. Depending on a country from where bettors are playing there are some restrictions like age limitations for some games (only gamblers over 18 years can deposit real money). When this is done, a player can now set some basic configurations in the Hit 2 Split slot casino game. To increase and decrease bets, gamers can press the right and left arrows at the “Level” mark. There is a total of 5 levels and coin value can be shifted in the same way. To adjust wagers automatically to the maximum, players can click on the “Bet Max” button. The number of lines is not fixed, and it can be changed by gamblers desire. The NetEnt developer provided the “Autoplay” options for all players who want to spin the wheel in the Hit 2 Split slots in more comfortable way. When these settings are set, players can click on the “Spin” mark to start spinning. All the time while betting, gamers can track down the score by looking at the bottom main menu. When playing for free, players from the UK (and other countries where betting is allowed) will receive 5000 free coins to get things started. While spinning the wheel of luck, gamblers can find lots of fruity signs with different values. Symbols in the Hit 2 Split online game have one unique characteristic. They all come in a single and double form and not just regular signs, bonus icons as well. Besides fruit icons, bettors can also collect 4 playing cards from J to A and 2 bonus icons that can be used for gaining extra free cash prizes. Scatter – blue diamonds are extra icons. They can be used for triggering special free bonus spins. The more scatter symbols a player obtains, the more rounds he/she will gain to spin for free. For gathering 4 of these signs, bettors will get 3 free spins. The maximum number of extra turns is 30. This prize can be won in a case that a player gets 10 scatter symbols. Depending on a number of extra icons, gamers will receive multipliers from 2 to 10. This actually means that a gambler can spin free rounds with multipliers turned on all the time until all free spins are used. Wild and Stacked Wilds – pink diamonds are wild cards. They can substitute all symbols except for the extra card. They can appear on any reel at any moment and change player’s luck in a second. The Hit 2 Split is a game of chances and with the smart gaming plan winning odds can be improved dramatically. For example, setting stakes to the maximum will ensure that player can gain some of the highest payouts in this casino machine. If a wager is lower, that can prolong betting time, but in that case, maximum prizes will not be available. The more lines are turned on, more combinations a gambler can get in a single spin. Stacked wilds can enhance the odds even more because that can increase the number of possible outcomes multiple times when included in a winning combo. The best thing that a player can do is to collect blue diamond icons to trigger free rounds. When playing for the real money the goal is always to bet for free as much as possible because this way bettors will improve their odds after every turn without placing any bets. The highest payout that can be won in a Hit 2 Split casino free machine is a 5000x jackpot prize in a case that a player gets 5 wild symbols in a single spin. This is definitively a winning combination that is worth waiting. A game can be played via almost every gadget like mobile, tablet, etc. This is a modern themed pokie with an old fashion fruit base that every gambler can master in no time. The Hit 2 Split game has a fair system infused in it which guarantees that every player will have the same winning chances regardless of previous wins or someone’s betting budget. Set the table and play to score. 0 responses to "Hit 2 Split Slot"